Prepping for your waxing appointment is just as important as your post wax care. In order to get the best results possible, there are a couple things that you can do to prep for a wax. The length of the hair being waxed needs to be about 1/4th of an inch long. This typically means about 3-5 weeks of growth. If the hair is not long enough, the wax will not be able to pull it from the root. This will cause the hair to break and thus grow back faster. Yuck! Keep in mind, if the hair is too short OR too long it will actually hurt more to be pulled out! The key is finding the perfect medium to keep your wax as painless as possible. Don’t forget that once you start waxing, no more shaving! Shaving will cut the hair off at the surface and disrupt the growing in process. Having all your hair on the same hair growth cycle will result in a perfect waxing appointment which is our goal. Exfoliating is when you remove the dead skin so there is nothing blocking the hair from being pulled out successfully. Using products when you exfoliate will help get the most of your wax. The best way to do this is by using the right products. 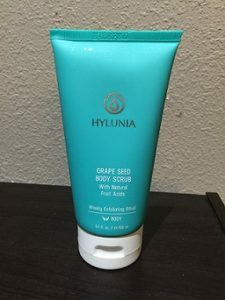 HK Wax Center – Austin Arbor offers the Grape Seed Scrub by Hylunia to use for exfoliation. This all natural scrub has ground grape seeds which buff away dry skin and helps minimize ingrown hairs and breakouts. After a couple of waxes, exfoliating is extremely important since the hair will get softer and finer after each wax. This will make it more difficult for the hair to push through the layer of skin, causing ingrown hairs. Products like the Grape Seed Scrub help the hair pass through the skin so your skin stays looking pretty!